"Our clients like Repeat Signage software and find it easy to use". DockCom Technology Services, Melbourne, Australia. DockCom Technology Services installed display screens and Repeat Signage at Watergate apartments. 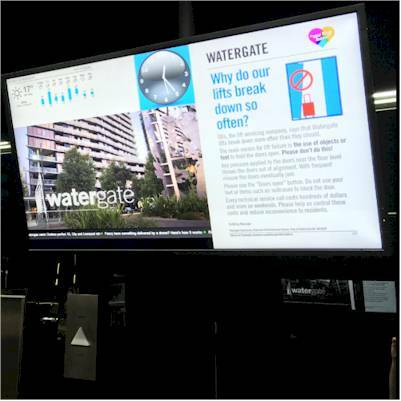 There are 2 displays installed at the lifts in 2 residential towers that display public notices, weather and news, which are easily updated with Repeat Signage software. "Business Manager, Marshall Delves, is very happy with the display signage solution, software provided by Repeat Software Ltd and hardware implemented by DockCom Technology Services. There are 2 displays installed at the lifts in 2 residential towers that display public notices, weather, latest news, etc. They are used to communicate important information to over 1,000 residents in the complex. Marshall Delves, the Building Manager, finds Repeat Signage digital signage software user-friendly. He frequently uploads public notices via Dropbox and it makes it very useful that they get automatically displayed almost instantly". 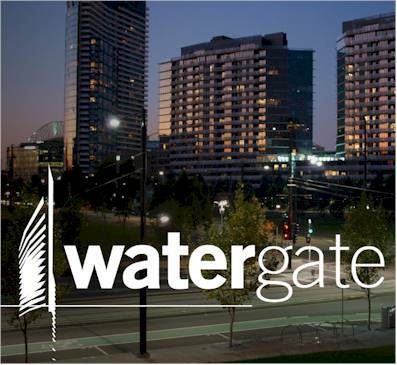 Watergate Apartments at Waterview Park, Docklands in Melbourne, is a luxurious, sustainable, community building. Facilities for over 1,000 residents, include a gym and outdoor recreation area, a swimming pool and business center, lobby for the enjoyment of all residents, bicycle racks and car parking. An architects vision come to fruition, you can view pictures and news at their website. Repeat Signage Standard edition is professional digital signage software for Windows. It is easy to use and you can create a presentation and have it playing in minutes. Presentations are created by inserting your logo, pictures, videos, date, time RSS feeds, spreadsheets, PDFs, documents and other media to create your presentations. A playlist allows the scheduling of information at various times of the day or week and you can update content via local network, from a website or remotely over the Internet.